The Metrocops are supposed to protect the Main Frame or Advisor Pods, and find out who the Traitor is, before he can do too much damage. They also have to be able to do some team work even though they can't entirely trust each other at the beginning. Good way to try to stop the Traitor from being able to sabotage is to move in groups, even though if people can get seperated on death. Metrocop players can't see where the other players are, nor can they see if the other players are dead. Team Leader status is currently only a title, but in the future releases it will give the him or her some special powers and privileges. If you have a good reason to think someone is the Traitor, you can start a vote to mark them as a Hostile. There will be a pop up menu for all players (including the target) to vote. If the vote passes, the target wont be able to get through blue shields anymore, and he will be attacked by Combine Turrets, as well as Combine Soldiers and Stalkers. Unlike Revealed Traitors, he can still use unhacked Combine Interfaces. He can himself, or someone else who thinks he's not the Traitor can, start another vote to mark him as a Friendly again. The Director HUD will show who is marked as Hostile. If a person is marked as a Hostile, the Team Leader status will move onto the next person in line of succession. The order is: Noah, Eloise, Anders, Larson. In order to fix a Combine Interface you need to find a Stalker. 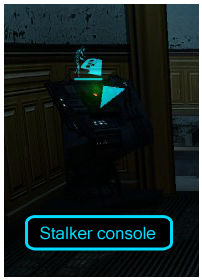 Consoles to spawn Stalker have a small Stalker icon in them, and will appear as an Objective in your Objectives hud. It's important to keep the Thumpers enabled at all times to stop Antlions from getting too close to your base. The Traitor will try to disable them if he can.